Make Your Own Drawing Space! You'll get a jump on drawing if from the start you begin by establishing the edges or outer boundaries of your drawing and drawing inside these boundaries that you have created. Let's start by calling this your own "Drawing Space". Knowing where the boundaries or edges to the drawing are hopefully will free you to feel more comfortable when you start to draw. This is a self-determined space with it's own height and width. When you make small drawings it is easy to see your whole drawing at once because it is smaller and more condensed for now. The whole drawing -- everything within your "drawing space" is called a composition. In smaller compositions all elements of the composition are more closely related because they share a small space. So with respect to the paper that you are drawing on -- let's begin by making a custom space for you to draw inside. You can use any paper and any pencil. You don't need special drawing paper or special drawing pencils. For now, with a standard pencil you can press to make your marks darker and draw with less pressure to make lighter marks with your pencil. I am using a darker drawing pencil here to make darker marks so that you can easily see my marks. This drawing pencil that I am using is called a 6B - you don't need this for now but you may enjoy it sooner or later. Draw your "drawing space" in the center or the middle of your paper and leave plenty of plain paper all around the sides of your rectangle. Don't use the edge of your paper as one or two sides of your rectangle. This would cause you to put your box in a corner - and you want the box in the middle of the paper with plenty of blank paper all around. For now, just draw one rectangle per piece of paper rather than several rectangles on one piece of paper. Don't worry about using up too much paper -- your learning is worth multiple sheets of paper. If you want, you can use the blank sides of recycled pieces of paper. Let's make our first of several of these now. We will use one sheet of paper -- and just one side for each shape that we draw that we are now calling your "drawing space". Keep the size of your rectangle no larger than the palm of your hand. Again, don't use the edge of your paper for one or two sides of your rectangle. Keep your rectangles floating in the center of your paper. Also, for now, don't draw several rectangles on one piece of paper. Again, just draw one rectangle per piece of paper with lots of space around the rectangle. Let's start with a horizontal rectangle for the shape of this first box or what I am calling your "drawing space". This is called the format. Additionally, this format can further be called a landscape format. The word landscape refers to a rectangular format that is WIDER than it is high. It goes in the direction of a horizon just like you would see in a natural landscape setting where you can see far and WIDE! Make your own free form format and still center it too in the middle of your paper and make it not much bigger than the palm of a large hand. For drawing a vertical rectangle you may want to change the direction of your paper to the vertical position. This way your paper is higher than it is wide. I did not do this in the adjacent video but it is a good practice to do this -- or at least be aware of the direction that you paper is positioned. The vertical format is called a portrait format. When drawing a portrait often the paper or canvas is turned so that it is HIGHER or more VERTICAL than it is wide. We will repeat drawing a rectangle in the center of our paper not much larger than the palm of our hand. It will float in the center, be the only rectangle on the paper and be surrounded on all sides by plain paper. This time it is a portrait or vertical format rather than a horizontal or landscape format. Making many, many repetitions is the way we learn. So that you don't think that all drawings and paintings must be made on or in squares or rectangles we will also create a free form or non-rectangular format. Starting to work with this now will allow you to experiment with this non-rectangular format from the beginning. You could also make holes or open shapes or spaces in the body of the format. You can make the edges of your more wild format with curved and straight lines or only straight lines with different angles or you can only use curved lines without any straight lines. Sometimes these formats are called (in paintings) shaped paintings or sometimes these formats are said to be "organic". Nothing is very standard in the terms that are used for these "irregular" formats -- and the formats are not standard! Make your own free form format now. Draw it in the center of your paper and again make it not much bigger than the palm of a large hand or the size of a smaller hand. When you make your formats you can use a specially made darker or lighter drawing pencil -- or you can press lightly and make a light line or harder and make a darker line. With pressing harder you can risk making a groove into your paper. This is almost NEVER a good idea or a good practice. Here I am working to make the format more "squared up" with 45 degree angles on each of the four corners. Using straight lines and making "square" corners is not necessary but it could be something that you like to do. Many people tell me that they can't draw -- that they can't even draw a straight line. People say this as a defense that in their mind cuts them off from even thinking about attempting to try to learn to draw again. It doesn't even make sense in a logical way because EVERY ARTIST who really wants to draw a straight line uses a ruler or another straight edge. Some people have even told me that they thought that it would be cheating to use a ruler to draw a straight line! It can also be helpful here to use a clear plastic right triangle as well a ruler to make the corners more precise and to keep the horizontal and vertical lines parallel to the edges of the paper. You can be casual with drawing your formats our your can make them more precise. It is your choice. Here I'm using a straight edge again -- but not in a precise way and the format is closer to being square. This drawing pencil is made of wood with a core of graphite. When you use a pencil to make a drawing, the medium is called "graphite". This pencil is numbered "3H" on the end that by the way, you DON'T SHARPEN OFF. That way you can always see the number on the pencil. A "3H" pencil is a fairly HARD "pencil lead". Because it is harder and not softer, not much graphite goes on to the paper and thus is makes a lighter and usually thinner line. You must resist the urge to PRESS this pencil down to make a darker line. If you want a darker line then switch to a softer pencil -- like a 2B or 4B drawing pencil or even a regular #2 yellow pencil. Again, you don't want to press into your paper to create darker lines. Again, pressing too hard could leave a groove in your paper that will show up later when you work across it. Sometimes a groove can be deep enough that it shows up in layers of paper below your current paper! If you are using your paper inside a sketchbook or at the top of a stack of paper, a pressed in groove can show up in paper below what you are currently drawing on. I drew on this paper with a softer and thus darker pencil so that it could be see easily on your computer screen. I did not use the 3H here to demo because it is harder to see -- which is the point! Here IS a smallish format. It is not very high but it IS fairly wide. How would you describe this format? Is it a horizontal and thus landscape format? Or, would you say that it is a vertical and thus portrait format??? I'm sure that you know that answer. But it is a good idea to use and repeat what you are learning often. Learning accurate art language will help you be able to use the specific art words in your own self-talk when you are looking at and thinking about your work. When you begin to talk to other artists, designers, children or gallery people -- you will be able to communicate with them more easily using simple art terms or simple terms to say what you mean about visual media. With a lightly drawn format I went in and added a wall-to-wall design (wall-to-wall so far is NOT an art term). I wanted to show you that the edges of the format are easy to see when you DRAW inside the lightly drawn format. Now you can discover this for yourself by drawing any way your want INSIDE your FORMATS! Take your drawings past where you might have stopped before by drawing as much as you can from edge to edge filling the WHOLE of the format with many marks, lines and what you might call "shading in". You can use patterns and little symbols or "real" stuff or lines -- whatever you feel like drawing and experimenting with in this moment. Remember this is all for you to begin to experience drawing and to gain some "low stakes" experience that doesn't have to be anything or turn out in a certain way. This is just the beginning of learning to draw. Be sure not to harshly judge what you do and be open and accepting of what you do draw NO MATTER HOW IT TURNS OUT. Think of this beginning lesson as and a great start along a well crafted drawing path. Faithfully taking this path will create in you some easy and eventually advanced drawing skills along the way. The key is to play and be easy with yourself and your expectations. Here is a little format with some subject matter that I made up out of my mind. This composition is in a vertical or portrait format. As you can see, I drew the format first. In this case, I didn't have anything before me that I was going to use or really anything that I was thinking about ahead of time. In the future we will consider things and the position of things and the lighting even before we draw the format. We will also, in the future, change things around in the still life and change our position within an actual landscape as we experiment to make a good marriage of the format and the drawing inside the format. 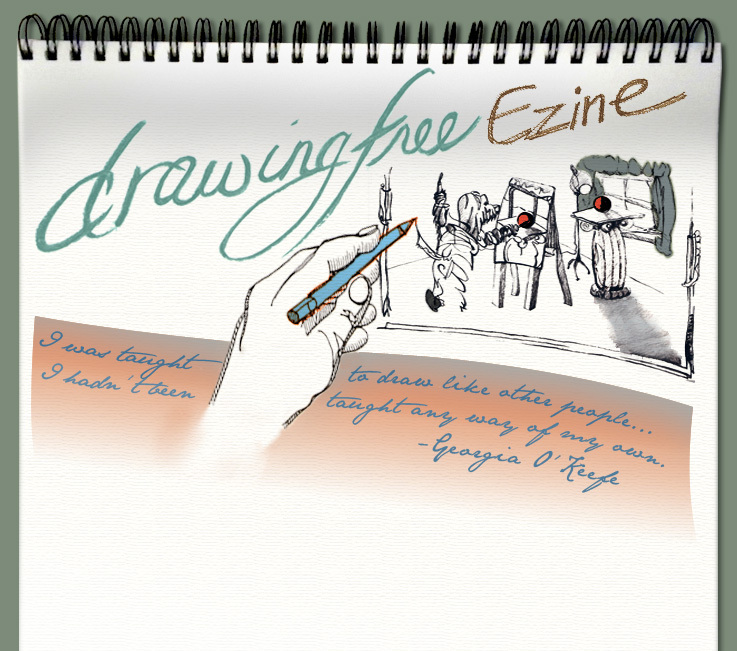 This will all be shown in future Drawing Free Ezines. For now, I'm making it up and you can too -- or you can set-up a still life. I've changed the drawing from just a line drawing to a line and value drawing. This just means that this line and value drawing contains lines that make the forms and values that are drawn in with back and forth (in this case) pencil lines that have very little space between each pencil line. To make your value darker you can draw again putting multiple values on top of the already drawn values. This will work better for you in the long run than just pressing harder or using the darkest pencil first with just one pass of value. The gray values that I added to this drawing don't say much about the light source. The darker windowpanes and the darker liquid in the pitcher could indicate that the light is coming in from the window and thus from behind. When the light comes from behind it is called back lighting or that it is backlit or back lighted. The lemon and plate don't show this lighting. They could or they don't have to. If you wanted to be consistent and show your viewer the light without contradiction, then the light would also have been blocked and thus affected by the lemon. The lemon would be affected by the light as well. There will be more on this in future Drawing Free Ezines -- but I just wanted to point that out a bit for now. This compositional sketch uses similar subject matter but the format is changed to a horizontal or landscape format. The placement of the table is different and there is a darker value around the window behind the table. The lighting or illumination is fairly consistent with the way it works overall with each element. The window is moved over to the back RIGHT side of the format. This indicates or shows how the light from the window comes from behind and a bit towards the right and thus casts shadows more towards the LEFT. Notice that with our shadows moving down towards the LEFT we get some good diagonal lines or implied diagonal lines. There is no end to what you can do within a format. And, starting with your own custom format, you will be starting with the end and "final frontier" in site! Or in other words, you will be making art from the start by beginning with your final format. By repeating this lesson you will merge the more often than not forgotten and undervalued relationship between the edge of the outer and the inner. Working with a format from the start, you own the edge of the field or space and its ground or contents from the start. Format and its contents have long been separated in our "one paper one picture" minds. The awareness of the relationship between ground and figure must be fuzed to make art that knows both its inner and outer nature. This simple format lesson starts you on this inevitable journey.